SPY rose 0.9% this week, while my account fell by 1.0% to its third-lowest value ever. 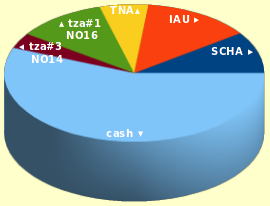 0.7% of my loss is due to TZA#1, which dropped sharply Friday morning before I could do anything about it. The rest is due to wrongly-timed day trades. Euro news: Goldman Sachs (“The Squid”) has installed its puppet governments in Greece, Italy, and the European Central Bank. The end may be nigh. Or the EU might last a few more months. US news: The bankruptcy of MF Global (brought down by Goldmanite Jon Corzine) may be this year’s ”Bear Stearns moment”, implying that there may be six more months until the ”Lehman moment” when the global stock market collapses. There is now only one week left before the congressional supercommittee reports that it can’t do anything about Republican econoterrorism, which will kick off the automatic austerity measures and (possibly?) riots. The Black Bloc (who are apparently police officers wearing costumes) have started attacking the Occupy Wall Street protesters. SCHA: Not going anywhere, but PPO is still positive so keep it for another week. IAU: On Thursday, gold got down to only 8¢ above my stop price! But didn’t stop out and now it’s going back up. It seems gold is making a low every eight days or so, with the next bottom at maybe $17.79 on NO 23. However, Kevin McElroy writes that platinum might be a better buy right now. Platinum and gold track very closely, so I guess I'll buy only one of them now. For Monday: put about 5% of my funds into buying PPLT. TZA#1: Bought more on Wednesday because PPO returned to -0.5 and the shares made a new low for the day. Husbanded it all day as a day-trade, but kept it so now it's a swing! Nasty drop Friday morning wiped out my gains. TZA#2: Bought because it plateaued below the swing-trade recommended price. Bought again because the market it rose to its 20-hour average. Sold because the market was still above 20-hour average at end of day. TNA#5: Bought because market jumped Friday morning, but then it plateaued for the rest of the day. TZA#1: Bought too early for a bad price. Sold on-time for the expected price. Bought more at a better price, but this ended up just increasing the magnitude of my loss. TNA#5: Normal hourly trade in progress. Here is a chart of the hourly PPO indicator. Note that it used to have roughly one peak per week, but since mid-October there are now roughly two peaks per week. The market seems to be ”marching on the double” nowadays. Perhaps I should avoid trading during such double-time periods, or maybe I need to calculate a different set of parameter values for such periods. On Tuesday I eyed out a day-trading rule and tried it out: using the 1-minute PPO(10,30,20) indicator, buy when the signal and histogram are both positive and sell when histogram goes negative. Result: loss. After doing the trade, I wrote a program to determine what I should have done. Result: I should have bought when the signal was NEGATIVE! But at least I got the PPO parameters correct. This rule would have made money over the last month, but not very much and not during this week (four trades, total -0.5%). This rule triggers very rarely and most are before 11 AM when I’m not watching the market. Conclusion: I do not know how to do profitable day-trading at this time.